T.K.Shanmugam was the third of the triumvirate (Sankaradas Swamigal and Pammal Sambanda Mudaliar being the other two) whose contribution to the world of Tamil theatre remains unparalleled. Unlike most of peers who migrated to cinema(but still retained their drama roots), T.K.Shanmugam never entered the tinsel world in a big way, choosing to give it all to the stage. His contribution to spread the art form was immense and went beyond just his own stage performances. His active part in organising drama festivals, conferences and lectures on various aspects of Tamil theatre made him a legend and earned him the respect and association of people across the political and social spectrum. Despite the many memorable plays performed by him on stage, which included Abhimanyu Sundari (written by his Guru Sankaradas Swamigal in the course of just one night, keeping in mind his star pupil) and Raja Raja Chozan in the later parts of his career, the play with which he came to be most associated with and earned him the title by which he is recognised even today was Avvaiyar. In his amazing memoirs, Enadhu Nataka Vaazhkai, he writes that the man who helped script the story of Avvaiyar on stage was P.Ethirajulu Naidu, a Tamil teacher in Rajapalayam. With the script on hand, the biggest decision facing the troupe was the choice of person to play the title role. The first choices were T.K.Shanmugam’s elder brother T.K.Muthuswamy or Nadippisai Pulavar K.R.Ramaswamy, who was then part of the group. T.K.Muthuswamy declined as he had given up active on stage performances while K.R.Ramaswamy refused on the grounds that it had been a long time since he had acted in a female role. With the only lady artiste in the troupe M.S.Draupadi( who later became a noted film actress) being young, the mantle fell on T.K.Shanmugam to don the role. 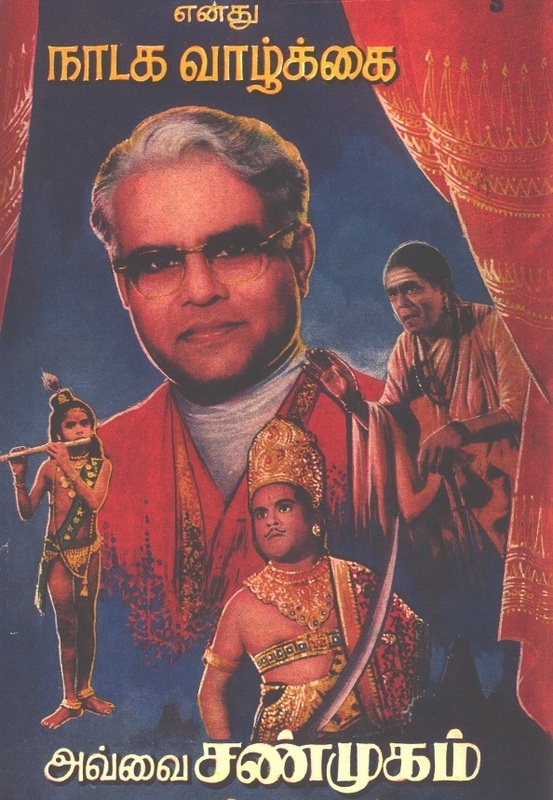 The songs for the play were written by an actor in their troupe, P.S.Venkatachalam. Besides new compositions, songs of poets such as Mahakavi Bharathiyar, Bharatidasan and Kavimani Desiyavinayagam Pillai too were used. The play was inaugurated in Madurai in 1942. Contrary to expectations, the play did not have a popular run initially. Collections too were poor. T.K.Shanmugam writes that the inaugural show itself was not free from incident, with the actor playing Goddess Saraswathi falling on stage from a few feet above (where she was seated on a lotus) due to a technical glitch. The “drama book” was released in 1943, after which the response started picking up. It was in 1944 during a performance in Erode that the title of “Avvai” was given to T.K.Shanmugam by R.K.Shanmukam Chetty (later the first Finance Minister of Independent India). The play was a massive success and soon it came to be staged to raise money for various causes, such as the Ettayapuram Bharathi Mandapam Fund. In 1948, the play was staged 96 times in a row in Madras and was stopped only due to the immense back pain T.K.Shanmugam developed thanks to his gait in the play. “Ladies Special” shows too were staged. It was a long time wish of T.K.Shanmugam to get C.Rajagopalachari to watch the play. His wish was fulfilled on 25th of March, 1950 when C.Rajagopalachari presided over a special performance of the play at the Congress Grounds, Teynampet. His presence had been made possible thanks to the efforts of Kalki Krishnamurthy. Rajaji was astounded by the performance. Later, after having watched Gemini’s Avvaiyar, he was to remark in his diary that “T.K.Shanmugam’s play is hundred times superior to this picture!!”. Avvaiyar was also staged in Delhi, with Rajendra Prasad and Jawaharlal Nehru attending a performance and Rajaji acting as the translator. His immense passion and dedication (he even removed two of his front teeth for the play) towards his chosen field are truly worthy of emulation. T.K.Shanmugam passed away in 1973, aged just 60. His birth centenary was celebrated in 2012.